Maverick Field Test Set - MTS-206A Series | Marvin Test Solutions, Inc. The MTS-206A is a state-of-the-art portable test set for the AGM-65 Maverick missile system and for AGM-114 missiles. It combines the test capabilities of an I-Level test set in a compact, rugged enclosure suitable for field use. The MTS-206A performs parametric functional tests on Hellfire Missiles and on Maverick missile system components including: AGM-65 missile (all versions in tactical and training configurations), AGM-65 missile sections (GCS & CAS, all versions in tactical and training configurations), LAU-117 and LAU-88 Maverick launchers (all versions), and launcher-missile clusters. The design of the MTS-206A is based on PXI technology. PXI, PCI eXtensions for Instrumentation, is now being specified by most military and commercial customers as the platform of choice for field, intermediate, and depot test equipment due to its rugged construction, high performance, and cost-effectiveness. 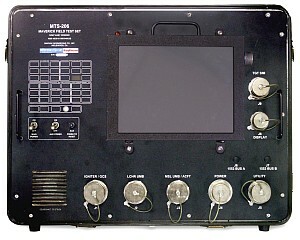 The MTS-206A shares the same architecture as the MTS-209 Common Armament Test Set, MTS-235 JSF Armament Test Set, AN/TSM-205B Hellfire System Test Set, and the PATS-70 Portable Avionics Test Set. The MTS-206A is controlled by an integrated LCD display and touch screen - Remote Control & Display Unit (RCDU). The RCDU allows operation of the MTS-206 from distances of up to 25 feet. The modular PXI chassis is secured via five shock absorbers to enable the MTS-206A to meet stringent shock and vibration requirements. Built-in heaters for the PXI chassis and the RCDU allow the MTS-206A to operate in extremely low temperatures. The menu-driven design of the MTS-206A simplifies operation and minimizes required training. The Main Menu provides for quick selection of the UUT by type and automatically configures the MTS-206A for testing. Cable detection is automatic and, in the event of a misconnection, clear prompts instruct the user as to which cables are required and how to identify and connect them. For AGM-65 seeker slewing and boresighting, the MTS-206A utilizes an embedded video window displayed on the RCDU and a virtual joystick that significantly reduces operating time and the learning curve. The MTS-206A is fully compatible with existing target simulators such as the AN/DSM-787 (IR), AN/DSM-129 (TV/CCD), and SMU-127 (laser) as well as with new target simulators such as the MTS-916 (TV/IR/Laser). When operating with the MTS-916, the MTS-206A test process becomes even more automated due to a communication link between the test set and the digital target simulator. The MTS-206A was designed to test all current and future versions of the Maverick missile system. Future growth includes the Dual Mode LAU-117 launchers (DML) as well as the latest versions of the AGM-65 missile including AGM-65E2 and AGM-65L and the latest versions of AGM-114 Hellfire missiles including Romeo. An innovative upgrade mechanism allows software upgrades in the field using a flash disk shipped from the factory to the country. The MTS-206A automatically saves data from all test runs. The saved test logs can be viewed on the MTS-206A display or transferred to any computer using the utility cable, which includes a USB interface. The test logs are used for trend analysis and for tracking of all tested assets, providing maintenance and readiness information to organizations that employ Maverick or Hellfire. The modular design and construction of the MTS-206A provides for simplified maintenance and reduced logistics. Available spare parts kits support in-country maintenance using the integrated self-test adapter that provides troubleshooting to the CCA level. The high MTBF and low MTTR ensure minimal downtime and continuous trouble-free use in the harshest operational environments. Built-in calibration references extend the calibration cycle to 2 years, and only require simple verification using basic PMEL equipment. This innovative calibration process eliminates the need to send the MTS-206A to the depot for calibration.